Long before their merger in 1961, Unitarians and Universalists were engaged in the major social justice causes of the day, often leading the way forward – the abolition of slavery, women’s suffrage, universal public education, prison reform, mental health, anti-poverty. In the 1960s UUs joined the struggles for civil rights, peace, and nuclear disarmament. Today we pursue these and other causes, guided, as always, by our principles – the inherent worth and dignity of every person; justice, equity and compassion in human relations; acceptance of one another; the right of conscience; the goal of world community with peace, liberty, and justice for all; and respect for the interdependent web of all existence of which we are a part. Among these causes are economic justice, environmental justice, immigrant justice, lesbian, gay, bisexual, transgender, and queer justice, racial justice. 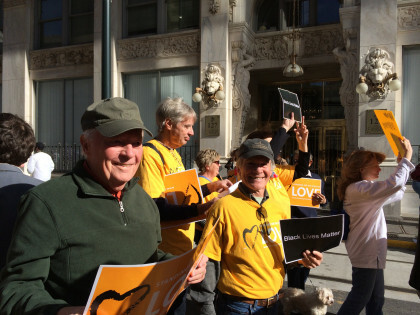 We support the Unitarian Universalist Association’s (UUA’s Standing on the Side of Love campaign, which seeks to “harness the power of love to end oppression”. We support the UUA’s endorsement of the Black Lives Matter campaign, regularly witnessing for racial justice on Crabapple Road in front of our sanctuary. Children, youth, and adults work with HomeStretch, an organization here in Roswell dedicated to getting homeless families back on their feet and into permanent housing. Our children and youth work with the Hamzah Islamic Center to support the International Rescue Committee in providing a Thanksgiving feast for refugees in the Atlanta area. 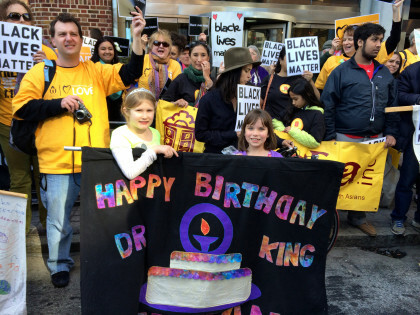 We march proudly behind our banner at the annual Martin Luther King Day parade in downtown Atlanta. We march in the annual Pride parade in Atlanta and staff a booth in Piedmont Park, publicizing our Welcoming Congregation status. We support Lost N Found Youth, the only organization in Atlanta dedicated to taking homeless lesbian, gay, bisexual, and transgender youth off the street and into more permanent housing. We make lunches for MUST Ministries. We regularly collect food and make ecologically friendly laundry detergent for North Fulton Community Charities. On Halloween our children trick or treat for UNICEF, and over the winter holidays they collect for the Unitarian Universalist Service Committee’s (UUSC) Guest at Your Table program. 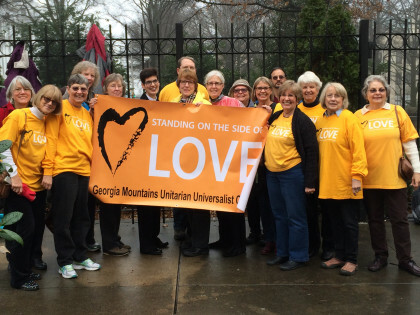 With members of other UU congregations in the Atlanta area, UUMAN members advocate for justice at the state capital on Moral Mondays. Every month, on 50/50 Sundays, we hold up an organization engaged in the work of social justice and share the week’s offering with it. We have offered a covenant group that met monthly to discuss issues of race and ethnicity. Quarterly we conduct a Faith in Action Sunday, offering children, youth, and adults the opportunity to engage in a variety of ways in a given social justice cause. At UUMAN we are working to live into our mission: promoting an open-minded search for truth and justice both within our walls and beyond.